Amanda Stucklin introduces this year’s Goldsmiths Fair. With the return of the Goldsmiths’ Company annual fair this September, Goldsmiths’ Company PR manager Amanda Stucklin describes the event’s history and the process involved in setting it up. 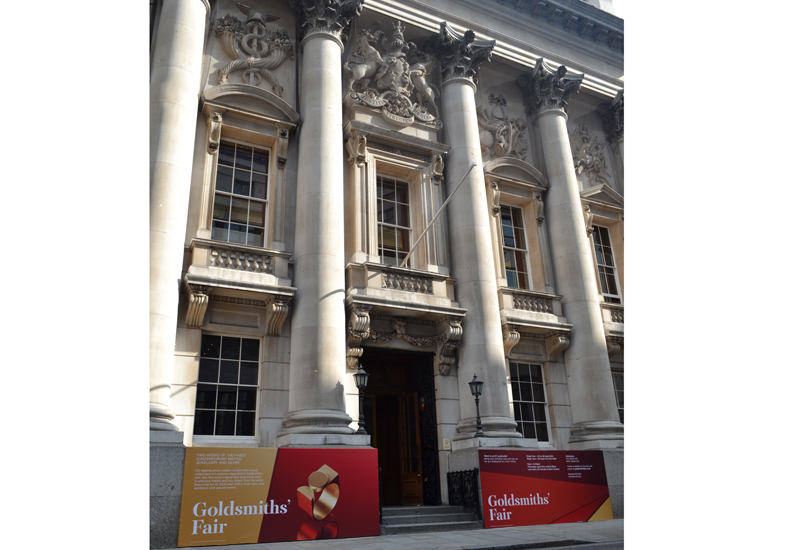 Undoubtedly one of the most important of all the Company’s many events is Goldsmiths’ Fair, the annual selling exhibition of contemporary jewellery and silver by designer-makers, which takes place every autumn in the gilded splendour of Goldsmiths’ Hall. The very first Fair, originally called Goldsmiths’ Craft Fair, took place in 1983. It followed on from the Goldsmiths’ Company’s series of exhibitions, entitled Loot, which ran from 1975 through to 1981 and was set up to help designer-makers combat the knock-on effect of the severe economic recession of the 1970s. Over its 28 year history, the Fair has helped establish and launch the careers of many current icons of contemporary British jewellery – not least, the likes of Stephen Webster, Cassandra Goad, Lesley Craze, Pippa Ramsay Rae, Barbara Tipple, to name but a few. 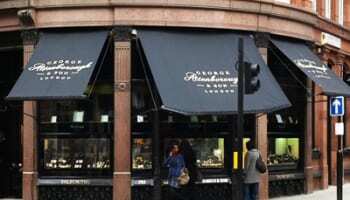 Several now have their own London showrooms and the majority sell extensively overseas. In addition, both past and present exhibitors have works in national museums and galleries in the UK and abroad. Today, the Fair appears to be have retained its popularity and has gradually become a fixture in the annual calendar for both the trade and the public alike. It gives buyers the opportunity to get a complete overview of styles and trends of what is on offer in the world of contemporary jewellery. Over a period of two weeks, 160 designer-makers from around the UK, including 10 recent graduates who are given free stands by the Company in order to help them in the early days of their careers, descend on Goldsmiths’ Hall, bringing with them a large display of jewellery and silverware. The idea of giving bursaries to graduates began in 2000 and many of the recipients now have flourishing businesses. With its focus on design and craftsmanship, the Fair draws collectors from both the UK and abroad. However, the Goldsmiths’ Fair’s greatest appeal is the fact that the jewellers and silversmiths are there in person. Visitors enjoy the opportunity to engage with them directly helping to understand their concepts and their dedication to hand-workmanship. Jewellery historian Vivienne Becker says: “This adds a very important human dimension to jewellery, which is after all, the most personal of all decorative arts.” Equally, all the makers relish the interaction with the client and the Fair quite literally resonates with their passion, design and craftsmanship. Work on the annual Fair commences almost as the previous ends. The Promotion department meets for a de-brief, which involves an overall analysis of every aspect of the organisation of the Fair, with comments and suggestions from both exhibitors and clients being taken into account. A plan of action is then initiated for the following year with work in earnest beginning nine months in advance with a call for applications. With only 90 stands available each week, only a small proportion of the 300 plus who apply are successful. This year applications were up by 30. A vetting panel considers each application and applicants have to meet the criteria of the Fair, which is essentially a show-case for the designer-maker. All exhibitors have to live and work in the UK, demonstrate exceptionally high levels of craftsmanship, skill and design and not employ more than five workers. International participation comes from the number of foreign designer-makers, based in the UK, who exhibit at the Fair. This year, 28 exhibitors fit into this category, largely due to the high standard and quality of teaching at the UK’s jewellery and silversmithing colleges, which attract so many foreign students to these crafts. Many of them then choose to stay on after their studies and work in the UK. Since becoming Director of Promotion, Paul Dyson has taken the Fair from one week to two weeks and each year new initiatives are instigated. Last year, exhibitors’ guests were offered the opportunity to have a cream tea in the Café at the Fair, which proved hugely popular and, this year, these invitations will be increased. Evening events with publications or organisations are a regular occurrence. Last year, some 12,000 visitors came to Goldsmiths’ Fair to admire and purchase, many for the first time and some from as far afield as France, the USA, Canada and Australia. The average price of a purchase at the Fair is approximately £200/£300, although the range varies from as little as £50 upwards into the high thousands. The Goldsmiths’ Company is one of the Twelve Great Livery Companies of the City of London. Numbered five in order of rank, it received its first royal charter in 1327, making it one of the oldest of the 107 Livery Companies which exist in the City of London today. With its roots firmly in the trade guilds of the Middle Ages, the Goldsmiths’ Company has been responsible for hallmarking precious metal articles over 700 years. In fact, the word ‘hallmark’ originates from the fifteenth century when London craftsmen were first required to bring their wares to Goldsmiths’ Hall for assaying and marking. Today, over five million precious metal items are hallmarked by the Assay Office each year and the leopard’s head symbol of Assay Office London is the premier hallmark in the UK. In addition, the Company plays an active role as a supporter and promoter of its trade and industry, as well as providing financial backing to educational initiatives and national charities. The current membership of the Company totals 1800 and comprises freemen, liverymen and assistants. The Court of Assistants is the governing body of the Company and is presided over by the Prime Warden assisted by three Wardens. The Company has one of the largest freedoms of the City Livery Companies and while not every member is involved in the trade, at least 60 percent are. This is endorsed by the Company’s Director of Technology and Training Peter Taylor: “Support for the highest standards of both craft and design remain the paramount purpose of my department. Our programme of awards, bursaries and training opportunities, including the last indentured apprenticeship scheme for our industry, are at the heart of this effort. It is to help address these issues that the Goldsmiths’ Company has embarked on one of its most ambitious initiatives to date and the largest project that the Company has undertaken since 1892 – the creation of the Goldsmiths’ Centre. Work has already commenced on the site in Clerkenwell and the Centre, which is scheduled to open in the autumn of 2011, will incorporate an educational and training facility (the Goldsmiths’ Institute), workshops and starter studios, exhibition and conference space; and a café. 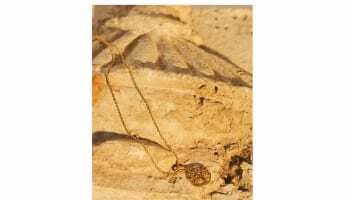 It represents the biggest single investment by the Company in its craft and industry in modern times and seeks to demonstrate the organisation’s commitment to its ancient goldsmithing roots. Aside from its role of support to the craft and industry of jewellery and silversmithing, the Goldsmiths’ Company also maintains a collection of antique and modern silver, contemporary jewellery and art medals. The collections are overseen by the Curator Rosemary Ransome Wallis who, with the help of the Modern Plate Committee, is responsible for the annual commissions and purchases which are added to the collection. Rosemary Ransome Wallis says: “As Curator of the Company’s Collection in the 21st century, I have the privileged responsibility of initiating patronage of contemporary silver and jewellery and witnessing creativity, at first hand, from living craftsmen”. The Goldsmiths’ Company’s extensive collection of jewels is considered one of the premier collections of modern designer jewellery in Britain today. It comprises 400 pieces and traces the evolution of modern jewellery design. Through its patronage, the Goldsmiths’ Company acted to stimulate the market for the artist-jewellery after the austerity of the Second World War. In 1961, a landmark exhibition, ‘International Exhibition of Modern Jewellery 1890-1961,’ was held at Goldsmiths’ Hall in conjunction with the expertise of the Victoria and Albert Museum, and brought this somewhat neglected art form back into the public arena. At the same time, De Beers Consolidated Mines provided £10,000 in sponsorship for a national competition ‘to stimulate advanced British jewellery design’. De Beers subsequently commissioned selected pieces from leading jewellers of the day, which were presented to the Goldsmiths’ Company. These jewels formed the nucleus of the Goldsmiths’ Company’s collection. One of the young new jewellers in the 1960s was John Donald, who along with Andrew Grima, Gerda Flöckinger and David Thomas, is credited as being one of the key figures who revolutionised British jewellery after the rather repetitive traditional jewels of the post-war years, and whose work has had a major influence on the subsequent direction of artist-jewellery in this country ever since. Following on from those early modernists, equally influential in the 1970s and 1980s was the jewellery of Wendy Ramshaw, David Watkins, Charlotte de Syllas, Dorothy Hogg and Jacqueline Mina. Wendy Ramshaw, whose famous ring-sets with their integral acrylic stands are icons of the age, is still regarded today as one of the UK’s leading modern designers and artists, and is attributed with having made a significant contribution to the development of modern jewellery design. The 1980s also saw the emergence of individual artist jewellers, such as Kevin Coates, who creates jewels both for adornment and as an art form. Since the 1960s, the Goldsmiths Company has continued its support of the artist jeweller with a focused acquisitions programme. The commission enables the artist jeweller to undertake a one of a kind piece and the result is a unique collection of jewels. Jewellers whose works joined the Company’s collection in the 1990s include Catherine Martin, Susan Cross and Susan May and most recently young jewellers including Andrew Lamb, Jo Hayes-Ward, Kate Smith and Will Evans. Equally important to the on-going formation of the Company’s contemporary jewellery collection is the general support the Company has given and continues to give the jewellery industry in the United Kingdom. Throughout the latter half of the 20th century, the Company has constantly held exhibitions of contemporary jewellery at the Hall and has lent its collection for exhibition extensively both within the UK and abroad. The Company’s involvement in 1976 with the Bicentennial Celebrations in the United States resulted in one of its most important Company travelling exhibitions, with 90 jewels from the Company’s collection being shown in six state museums. These initiatives aimed to help generate an international interest in modern British jewellery and to provide support to young fledging jewellers at the outset of their careers.